Last Thursday saw the biggest news we’ve had in recent times - Apple sent out press invitations for its much speculated September event. The iPhone 6S, a new Apple TV in addition to the release of iOS 9 and possibly OS X 10.11 are rumoured to be highlights of the event. The invitation itself shows Apple's funny side. 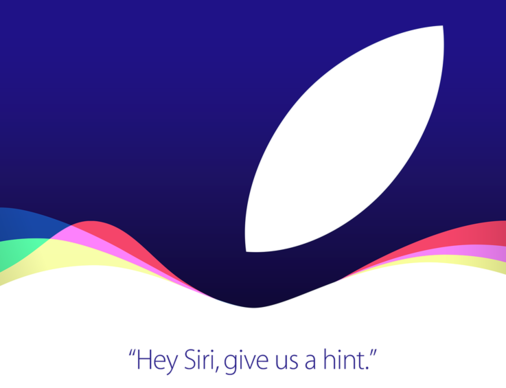 The invitation tag line reads “Hey Siri, give us a hint”. True to the tagline, when Siri is asked “Give us a hint”, she gives a number of humours replies, relating to the event - so if you’ve got a second give it a try! Alternatively, feel free to comment and share with us your own 'in depth analysis' of the invitation. I've seen some wacky ones with past events! A number of rumours regarding the details of the iPhone 6S have also been making the rounds this week, and there will be a MacTalk iPhone 6S rumour roundup in the coming days. Rumours have also been flying regarding what the upcoming 4th generation Apple TV update will entail. The main new features are supposedly a faster A8 processor and an App store which. There is a strong suggestion that there will be a focus upon casual gaming, aided by a new touchpad remote. Siri is also thought to be making her AppleTV debut on the updated set. Apple is expected to continue selling the Apple TV 3rd gen as a low cost option, alongside the Apple TV 4 which is apparently going to be priced between $150 and $200 (US), however expect a higher price in Australia with the poor exchange rate. Intel yesterday announced its latest range of processors, named 'Skylake'. As expected, many of the announced processors are suitable for Apple's range of computers. The new processors feature modest improvements in performance and integrated graphics, while at the same time reducing power usage. These improvements should translate into 2016 Macs with improved performance and better battery life. In other news, Apple has initiated a recall/repair program for owners of the iPhone 6+. Apple will replace faulty 6+ camera modules, as complaints about blurry photos have been building. Wouldn’t it be a shame if those “Shot on iPhone 6” commercials featured blurry photos!